Burnished concrete is conventional concrete trowelled more than twice to make the concrete surface hard-wearing with a durable finish and a great surface lustre. It is majorly used in residential and commercial buildings. Fig 1: Burnished concrete in residential floor. In this article, we discuss the work procedure, types, advantages and disadvantages of burnished concrete. In this method, trowelling is used to obtain the required surface lustre. This can either be done by hand trowelling or mechanical trowelling. Many factors affect the burnishing process of concrete such as the time of concrete placement, slump, compaction, finishing techniques and curing. These properties of concrete must be stringently ensured to get a consistent high-quality finish. The concrete strength should typically be at least 32 MPa to ensure sufficient fine material is available to achieve a good surface finish. The steel trowel burnishing process typically requires a concrete slump of 80 to 100mm with a tolerance of 15-20mm. The desired outcome of burnishing is to achieve a smooth, impervious and durable surface, free of residual trowel marks. In this type of burnishing, waxes and resins are used as toppings on the concrete floor to make the surface shine. Floor waxes, liquid polishes and resin-based coating applications can also be used to produce a burnished finish. These are multi-layer applications which, after the recommended curing period, are burnished or polished using polishing equipment. The degree of lustre achieved is dependent on the quality of the concrete density, coating product and the burnishing technique. The concrete that must be burnished should comply with the requirements of AS 1379. The concrete must have a maximum nominal aggregate size of 10, 14 or 20 mm and shall be placed by means of the chute, pump, kibble. 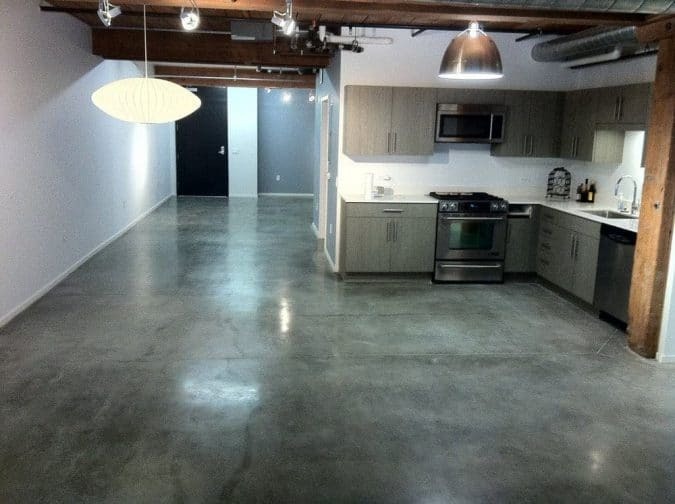 If the concrete floor is designed to be of any specific colour, the cement and the colour pigment must be specified. The concrete shall have a nominal slump of 80-100mm with a tolerance of ±15-20mm. The concrete must be transported by the means of agitator trucks to the site as rapidly as possible. No extra water shall be added to the concrete on site. The formwork shall be filled with concrete to the intended level without inducing hollows, depressions or screed lines. Any hollows and depressions shall be filled with concrete and not slurry. Concrete shall be adequately compacted to ensure the expulsion of entrapped air and surface imperfection. For the slab thickness above 200mm, immersion vibrators must be used. Finished concrete surfaces shall have a maximum deviation of 12mm from a 3-m straightedge placed anywhere on the surface of the concrete. Steel trowel burnishing of concrete surface is obtained by repeatedly working the surface of the concrete using either a hand trowel or mechanical trowelling machine until a lustre is produced on the surface of the concrete. Working repeatedly on the concrete surface makes the concrete achieve stiffness, ensures maximum durability, impermeability and abrasion resistance. The trowelling shall be undertaken with consistent pressure. Each trowelling shall be at 90° to the previous pass to eliminate the development of hollows, ridges and depressions. If the concrete becomes unworkable due to lower water content, the addition of water or wet wiping to the surface of the concrete during finishing shall not be permitted. Fig 2: Finishing of burnished concrete. 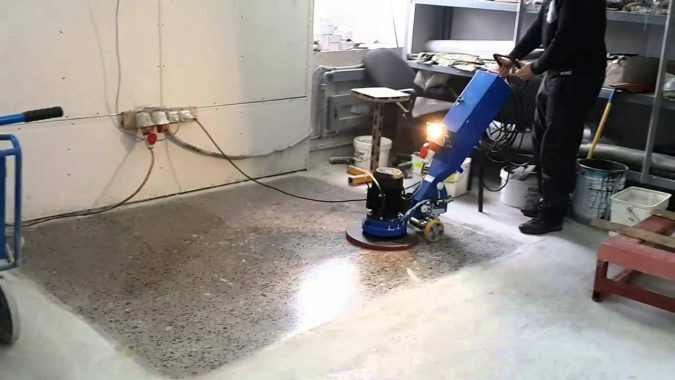 Burnishing of concrete done using the application of wax and resin must be steel trowelled to provide a trowel-mark free concrete surface and not overworked to such an extent as to result in inconsistent surface colour. Where resin or other chemical sealer products are used, they shall be applied to the surface and finished in accordance with the manufacturer’s recommendations. Where natural wax products are used, the surface shall be suitably prepared and the product applied and finished in accordance with the manufacturer’s recommendations. The finished concrete is cured for a minimum of 14 days and a maximum of 28 days to keep the concrete surface wet and prevent moisture loss due to temperature. The curing process must be done as soon as concrete sets. It must not be delayed for more than 3hrs after finishing operations have been completed. Generally, for this type of work, penetrating sealers are used to seal the concrete surface after the curing process is completed. The process of applying sealer and its curing process is done as per the manufacturer’s recommendations. Periodical surface maintenance and cleaning must be done to keep the concrete surface clean. Burnished finished concrete surface has durability and is extremely strong. It can easily withstand heavy foot and equipment’s load. Properly installed, sealed and maintained burnished concrete floor has a life span of more than hundred years. As the surface is smooth and even, maintenance is very easy. Care must be taken that dust does not accumulate on the surface. The properly finished surface is water resistant. As the trowelling process makes the concrete dense and highly durable, the concrete becomes very hard, so it won’t give cushion feel under feet, making it uncomfortable to stand on for long periods of time. Another drawback of burnished concrete floors is that they do not tend to retain heat very well. That means in winter, the surface of the floor becomes cold. If concrete flooring is not properly finished and sealed, it will be very susceptible to penetration by moisture. As the surface is hard and strong, it produces loud sounds when walked on.